Lyra is a retro, statement collection, made for relaxing. 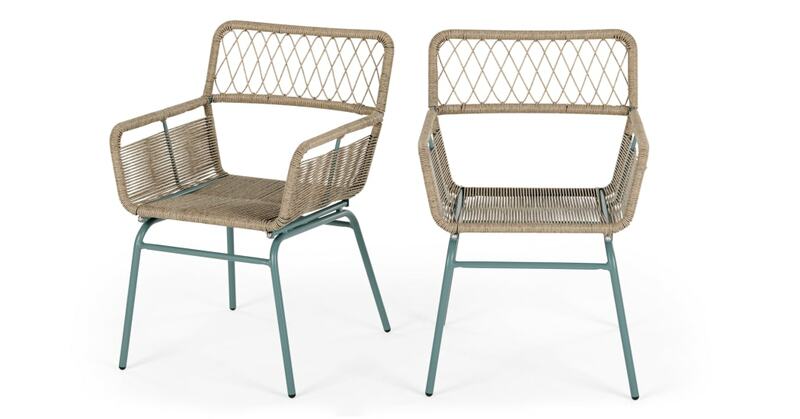 It's crafted from woven poly rattan and a grey metal frame. Do al fresco in style. The seats of the dining chairs are woven from a soft poly rattan, which gives slightly beneath you for extra comfort. They’re ideal for lazy barbecues and summer evenings. This vintage-look dining chair set is ideal for bringing a retro style to your outdoor space. Make a cosy corner on your balcony, or add the matching dining table in bigger spaces.